Summit senior Jackson Stone takes control of the ball at midfield Tuesday during a game against Battle Mountain. Summit fell 4-3, but coach Tommy Gogolen is happy with his teamâs play so far, which has the Tigers at 3-2 on the year with both losses coming by only one goal against quality opponents. Boys soccer coach Tommy Gogolen is pleased with his team’s play thus far with the Tigers securing a pair of victories to open the season, suffering two close losses against powerhouse programs and cruising by Palisade 9-0 on Saturday. At Palisade, Summit (3-2, 1-1) got two goals each from Conor Craig, Farid Infante and Ismael Valenzuela. Ryan Snell, Evan Wolfson and Saul Daniel also scored, and Jackson Stone held strong at midfield and fed the Tigers offense throughout the Class 4A Western Slope Conference matchup. In a 4-3 defeat against Battle Mountain on Tuesday, Summit was down by four goals early in the second half at SHS when the Tigers battled back. Senior goalkeeper Kyle Wertz recorded 10 saves in the contest, and junior Infante and sophomore Daniel each logged second-half goals with assists from seniors Stone and Craig. The third Tigers’ goal came when Stone had a free kick, Craig deflected the ball and, in a scramble in front of the net, Infante punched it in for his second of the day. 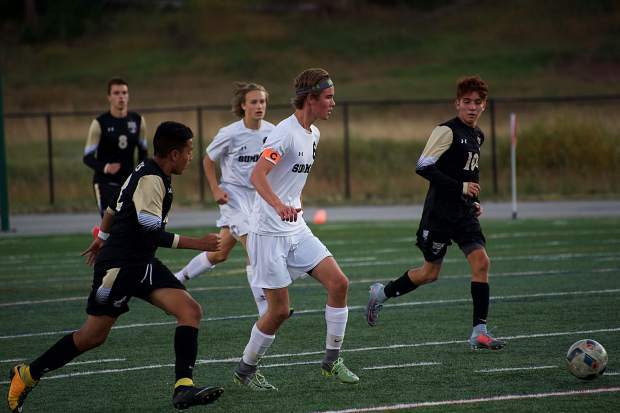 The loss to Battle Mountain came after Summit fell 2-1 in overtime against Valor Christian on Sept. 7. “We’re happy with 2-2, considering we gave Battle Mountain and Valor Christian a run for their money,” Gogolen said going into the game against Palisade. In the following game, Aspen came out hot and scored about 30 seconds into the Tigers’ home opener. “It was tough for the boys to deal with,” Gogolen said of going down by a goal so early, but the team fought back and prevailed 3-1. The Tigers have a short break before returning to action Thursday for a match against Steamboat Springs on the road. The Summit boys golf team secured a sixth-place finish as it played host to an 18-team invitational Wednesday in Keystone. The strong showing comes one week before the 15-team regional tournament in which the top two teams and best 13 individuals not on those two teams will advance to the Class 4A state tournament on Oct. 2-3. At Keystone, senior Tyler Horii led the Tigers and finished second overall with a score of 80. It was three strokes behind the tournament leader from Mullin, which also won as a team with a combined score of 242. Each team plays four golfers, and the top three scores are counted. Rounding out the top three for the Tigers on Wednesday were juniors Cameron Woodland (84) and Logan Pappas (93), for a team score of 257. Coach Gary Sorensen said all three — Horii, Woodland and Pappas — have put up state-qualifying scores at different times this year, and he sees each one as a contender to make the state tournament. On Wednesday, Pappas’ score was hindered by one hole that gave him trouble, Sorensen said, adding that because of a junior pro tournament at Keystone just a couple days earlier, the course was designed to be “extremely difficult” and nobody finished under par. At the beginning of the year, he said, the Tigers’ team scores were in the upper 260s. Since then, they’ve been consistently chipping away at it, first getting into the 250s and now the 240s. So far, their best team score was a 240. The Summit cross-country teams were in action Saturday at the 20-team Eagle Valley Invitation at Gypsum Creek Golf Course, and the boys team finished seventh overall. Leading the boys team, which with 25 runners on the roster is one of the biggest so far for coach Heather Quarantillo, was sophomore Max Bonenberger, who finished 24th overall in 18:11.70. Bonenberger has been the Tigers’ top finisher for much of the season and he ran a faster time Saturday in Gypsum than he’s ran all season. “He’s chasing big goals so today was a step in the right direction for him,” said Quarantillo, who added she’s loving have such great depth on the boys team. In the girls race, Summit was led by Noelle Resignol, who finished 13th at 20:14.50. Resignol cut about a minute off her personal-best time so far this season. Quarantillo was impressed to see her top female runner come out of the race among the leaders and maintain “a good, strong pace” throughout the day. Summit travels to Fruita next Saturday for the Anna Banana Invitational, a race featuring a relatively flat 3.1-mile true cross-country course consisting of asphalt, gravel and singletrack trail. The Summit girls volleyball team fell 3-0 in its home opener Thursday night in Breckenridge, losing 25-16, 25-19 and 25-23 to Eagle Valley, before a loud, bodies-painted student section. The Tigers opened the season at Wheat Ridge, a match they won in straight sets, before facing Palisade, Rifle and Glenwood. Summit also went 1-3 in a tournament in Machebeuf on Sept. 9. At the tourney, the Tigers defeated Manitou Springs but lost to Resurrection Christian, Colorado Academy and Lamar. Summit faces West Grand on the road Tuesday and has its next game at home vs. Battle Mountain on Sept. 26. Calls for individual stats and match highlights Friday and Saturday were not returned.